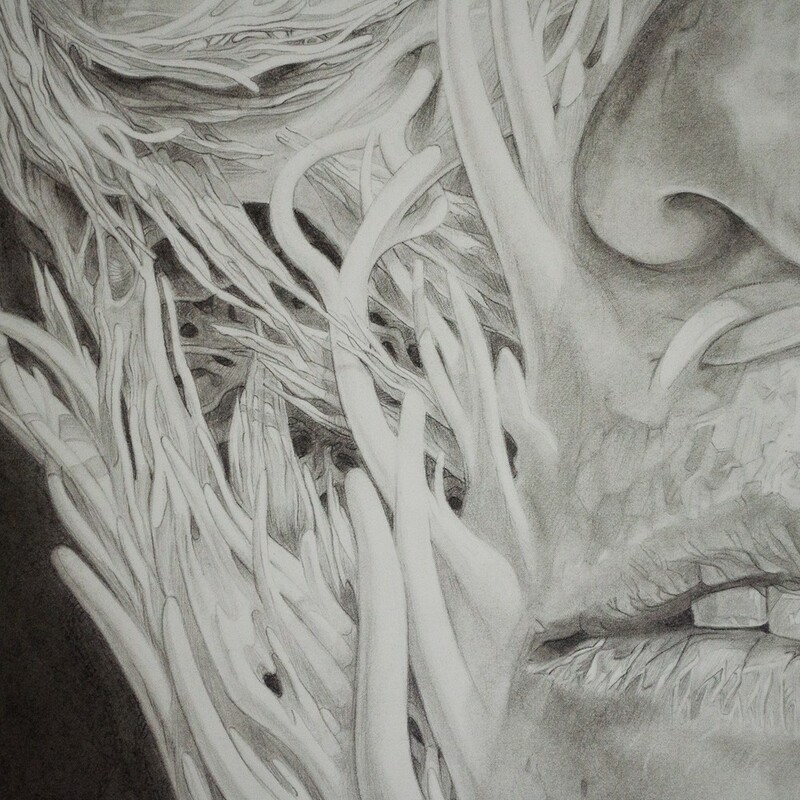 Hana II depicts a face from the future; a woman of mixed ancestry in a state of metamorphosis. The nature of the transformation is intended to be ambiguous, and can be interpreted as a regenerative or destructive process. Behind a layer of ‘mutation’, anatomy such as arteries, bone and connective muscle are visible. This is contrasted by the hyper-realistic reproduction of pores, hairs and skin ‘craquelure’; documented with rigorous accuracy. This dutiful mapping of a ‘future face’ is meant to be akin to religious ritual; a metaphor for the comfort and solace that comes with imagining the unknown. Preparing Hana II for framing in a tiny Vancouver apartment. 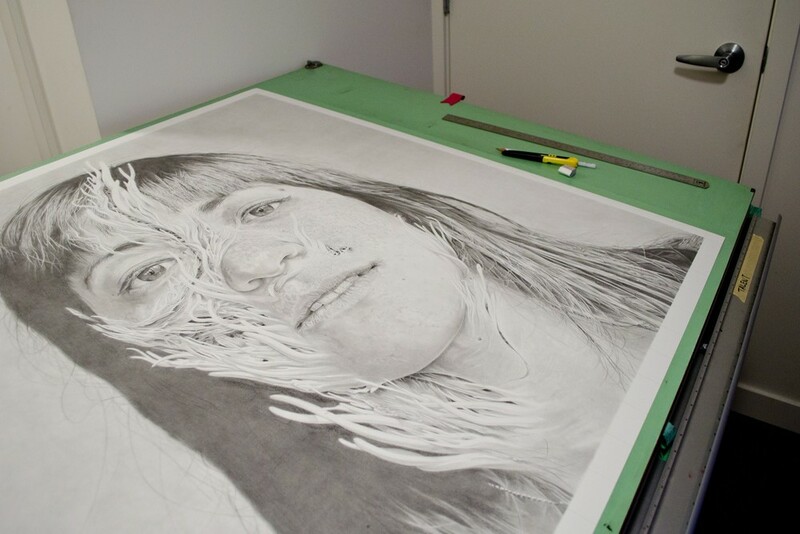 Hana II was drawn entirely with graphite pencils. No fixatives were used. The first pass was completed with H pencils, with a second finishing pass of 6B pencils to heighten contrast. While I can’t provide an accurate accounting of the time it took to draw, I estimate it is in the 400 to 480 hour range. Behind a layer of ‘mutation’, anatomical details such as the branch of an artery, part of the skull and musculature are visible. Other details such as pores, folds, ‘craquelure’, and hairs were reproduced with a hyper-realistic degree of accuracy. If the image were rescaled to life-size, the margin of error would likely be less than a 1/32 of an inch. Hana II represents my interest in drawing as a ritualistic, insuppressible process. It was important to me to construct a drawing scenario that invoked a sense of obligation and piety, and be as unforgiving — and humbling ­— as possible.